Its a very easy breezy breakfast with goodness of oats!!! Cool to room temperature and add strawberry slices before you are ready to eat. Eat warm or cold , with or without fruits, no matter how you eat it, you will like it for sure!!! 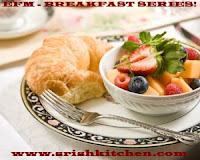 EFM June - Breakfast Series! I am not a oats fan. But i think sereved like this, i would love it. Simple oatmeat looks georgeous with the addition of strawberry, raisin and cardamom. Yumm. I love oats as breakfast always :) It feels so healthy. I love the berry addition to it. i love oats .. makes a filling breakfast ! 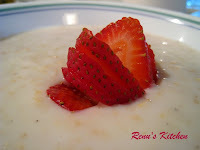 Lovely creamy porridge! Loved the addition of strawberries. Porridge looks delicious, its mu usual weekend brunch. Healthy one gal..Even i started inlcuding oats in my food tehse days.. I too do this lovely looking and healthy dear.. I like oats porridge too..@ This is a good a definite healthy treat! Oh wow healthy and filling breakfast.